Dollar $mart is a community coalition of companies, agencies, government, educational, non-profit, and other organizations. We’re focused on proactively increasing the prosperity of our community by increasing the prosperity of each of our citizens. To provide financial educational resources, training, and tools to empower underprivileged individuals living in Bay County and the surrounding communities to build and maintain healthy financial lifestyles. Financial Educational Awareness through training to individuals who receive free tax service through the VITA program. Financial education to underprivileged individuals and families using Money Smart curriculum. To work with local middle and high schools to incorporate financial literacy awareness into their teaching plans. To Partner with nonprofit organizations to bring financial awareness to those individuals who benefit from their services. To build healthy families through financial education to bring about social change within Bay and surrounding counties. To provide ongoing training resources and one on one support where low to moderate income individuals can to for financial education and understanding. Our Coalition tax sites have helped more than 3,000 families file their federal tax returns, resulting in more than $3,600,00.00 returning to our community in the form of Earned Income Tax Credit. Our clients have also saved more than $375,000 in tax preparation fees and Refund Anticipation Loan fees and interest. Through financial education, our clients will truly be have a stronger foundation heading into the new year when it comes to their financial stability. Individuals that work with the Dollar $mart counselors and take the classes will be able to manage their checking and savings accounts better and pay their bills on time more often than before they came to us. Corporate Partners: A.D. Harris Learning Village, BB&T Bank, Career Source, iHeartMedia, Copy Products, Florida State University, Gulf Coast State College, Hancock Bank, Internal Revenue Service, Publix, Regions Bank, Sonny’s BBQ, SunTrust Bank, The News Herald, Walmart, Wells Fargo Bank, WJHG News Channel 7, WMBB News Channel 13, Womens Club of Panama City, UF/IFAS Extension. 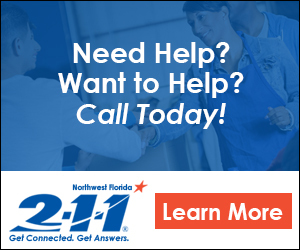 For any other income related question or need of service you can visit: www211nwfl.org or call and speak to an information and referral specialist at 211 or 850-215-6611. Click http://unitedwaynwfl.org/vita/ FOR OUR VITA (Volunteer Income Tax Assistance) PROGRAM.